From the Baldwin County Courthouse, go west on Hancock St. which becomes Highway 49 and follow Highway 49 south for 8.4 miles from the Courthouse. Turn left on Salem Church Rd. Three tenths (0.3) mile from turn is the church. In the picture are many people buried in Salem Baptist Churchyard; they are indicated with (SB). Left to right: Frank Bivins, Jr., Frank Bivins, Sr., Clyde Witworth Bivins, Florence Bivins Cheeves, Pope West, Silas B. Fuller (West Family Cemetery), Rosalie Neal, Alice West Foshee Fuller (West Neal Cemetery), Ann West Neal (West Neal Cemetery), Dock (Pope) Neal (SB), Josephine Smith Wilkinson (SB), Ollie Wilkinson, Lemma Wilkinson Neal (SB), Cicero Rollin Neal Jr. (held), Cicero Neal, Sr. (SB), Ruth Wilkinson Tolly (child), Sarah (Sallie) Neals Wilkinson (SB), Christopher Columbus (Lum) Wilkinson (SB), Mildred Wilkinson Hobbs (small girl) (SB), Austin Neal Wilkinson (SB); Center front: Mable (Pat) Neal, Vivian Wilkinson West (buried Coopers), Mary Neal Martin, Berta Neal Weaver. 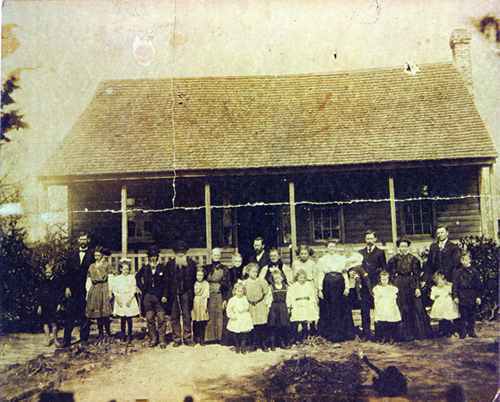 Picture taken about 1910 at Moses West's place. m. to Ruth Echols Hardigree Sep 16, 1981. Person tentative. This person was listed in TT but was not found in latest survey. William is no longer legible. Name per TT. Appomattox April 9, 1865, per RCSG. w/o S.J. Poindexter per TT. Stone no longer readable. per TT. Only Wilkinson is readable now. b. Hancock Co., GA Stone now unreadable. Info per TT. m. Feb 21, 1941, to Edna F.
"A devoted husband, beloved father and a friend to all" "Bob"
"A devoted wife, beloved mother and loved by all" "Aunt Ollie"